In my Creative Nonfiction class I have been encouraging students to write lists. 12 trips -- the 7-11 late last night, or the Grand Canyon, or Brazil -- any 12 trips. 12 events -- curriculum night at your daughter's school, your wedding, your uncle's funeral. 30 chapters -- number 1-30 down the left hand margin of a page; beside #1 write, I AM BORN, now write the titles for the other 29 chapters of your life. 10 things you did yesterday -- write this in ALL CAPS and see what happens (what does it feel like to write in all caps?). 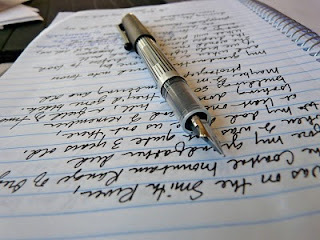 Next step: choose one item from one list and freewrite about it, that is, write without stopping for 10 minutes. Do this again, and maybe again on other items from the list. Next step: list 10 things that, if you were to choose one of these freewrites to continue, to turn into a story, you'd want to include. Now, give yourself a reward. Good job! Oh, I think I'd love this class. I'm loving doing 4th grade again with "Angeline" but your class would certainly be a step up and lots more fun than 4th grade math, which is sometimes terribly challenging to someone 67.